The new Biodiversity Footprint Calculator! A free calculation tool by Plansup to assess both current and future biodiversity footprint of a company’s product at the landscape level. With the tool companies can test the effectiveness of presumed biodiversity friendly measures. The calculator is a limited version of the full Biodiversity Footprint method and focuses on the impact of the two most important pressure types on terrestrial biodiversity: Land use and Green House Gas emissions. The impact is calculated for three parts of the value chain: Raw materials (/suppliers), Production process, and Transport. With the calculator it is possible to calculate the biodiversity footprint for multiple scenarios. You can start the tool by clicking on the picture above or by using the link at the bottom of this page. Please note that it might take a few seconds for the application to load on your system. First read the instructions provided in the tool in case you want to carry out a footprint analysis. Additional information is provided in fold-out tables and under the i-symbols next to the input screens. More information about the calculations, assumptions and used relations can be found in the methodology tab. Please note that by leaving the calculation page to the methodology page your inputs will be lost. Therefore it is advised to open the tool in a second screen which can be used for getting additional information, while your inputs remain intact in the other screen. Inputs will directly provide results at the bottom of the calculator page. After you filled in all the required (or available) inputs you can save your results in graphical (pdf) and tabular (Excel) format. The first scenario could describe the current situation and the subsequent scenarios can be used to describe all kinds of biodiversity friendly measures that are expected to change the footprint, e.g. for alternative situations or a future scenario. See for a quick overview of the Calculator the following Factsheet. 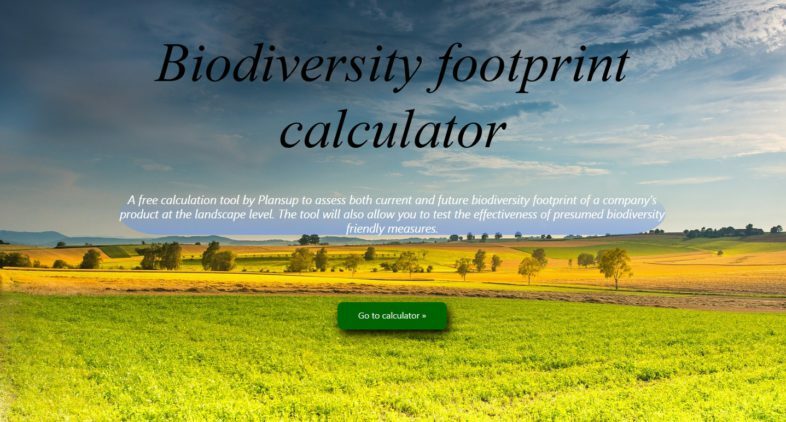 The methodology used in this calculator is based on the Biodiversity Footprint methodology developed by Plansup in collaboration with Wageningen Environmental Research (Alterra). The Biodiversity Footprint (BF) methodology is using parts of the internationally implemented GLOBIO methodology developed by the Netherlands Environmental Assessment Agency. In GLOBIO so-called ’cause-effect’ relationships are used (i.e. the effect of a pressure factor on biodiversity), based on the best available scientific knowledge. The local impact of pressure factors is determined in terms of the presence of species and the number of individuals per species. The BF method has been developed for the impact of three pressure types: Land use, Climate Change (via Green House Gas emissions), and Emissions of Nitrogen and Phosphorous into water. For the Dutch situation, the impact of Water extraction is added. By comparing the impact in the current situation with the impact in a new situation (after measures) the effectiveness of biodiversity friendly measures can be tested, not only afterwards but also in advance. On the basis of this method companies can assess their current impact on biodiversity and estimate their future impact after implementation of planned measures. Please note that the method does not distinguish between current or previous conversion of land. Although the company cannot be held responsible for the destruction of nature that was caused many years ago by former users of the land, it is responsible for its current use of the land which prevents original biodiversity to restore. The BF method is location specific while other methods such as Life Cycle Assessments use a regional approach and are less specific on the type of land use. As the biodiversity impact is highly dependent on the use intensity, a differentiation of land use types is essential for a correct biodiversity assessment. The method for the calculation is explained in more detail in the webtool application itself. Additional information on the full BF method can be found here.